Is FamilySearch any more reliable? The LostCousins newsletter is usually published fortnightly. To access the previous newsletter (dated 12 May 2013) click here, for an index to articles from 2009-10 click here, for a list of articles from 2011 click here and for a list of articles from 2012-13 click here. According a survey of forum members my article about Ancestry's data errors was by far the most popular of the last newsletter. Whilst it was fairly easy to identify incorrect entries that didn't belong in 1872, the real problem was the fact that the marriages incorrectly ascribed to 1872 wouldn't show up in a search of the years to which they actually belonged. It's heartening to see that as direct result of that article Ancestry have removed almost three-quarters of a million incorrect marriage entries from 1872! I wonder how many 'brick walls' will now come tumbling down? I haven't been able to check whether they've all been allocated to the correct years, but the entry that led me to the discovery - the misplaced marriage of Solomon Surch - has certainly found its way to 1887, where it belongs. One thing is certainly missing, though - a "thank you" note from Ancestry - but then again, I didn't do it for them, I did it for YOU! "The births registered in the year 1915 numbered 814,614; of these 778,369 were legitimate and 36,245 illegitimate." Ancestry show 1,697,117 births for the year 1915, which suggests that they have incorrectly recorded over 880,000 birth entries. Similarly in 1914, the Registrar General reported 516,742 deaths, but Ancestry list 820,533 deaths as being registered in that year, over 300,000 more. For example, Harriet Calver (no relation so far as I know) died in Hendon in 1884 aged 70, but at Ancestry her death is shown as 1914 (with an implied birth year of 1844, also 30 years out). These are all simple checks that anyone could have carried out, yet Ancestry - the biggest genealogy company that the world has ever known - let nearly 2 million errors creep into their records. It's not as if they are transcription errors - the data was provided by FreeBMD, who show the entries correctly in their own online indexes. When I was starting my research I tried using FamilySearch to trace my Suffolk ancestors, but kept coming up against the problem that transcriptions of Bishop's Transcripts didn't specify the name of the parish where the baptism took place - so I was sympathetic when another LostCousins members (another Peter) contacted me recently to tell me about the problems he'd found researching in Norfolk. 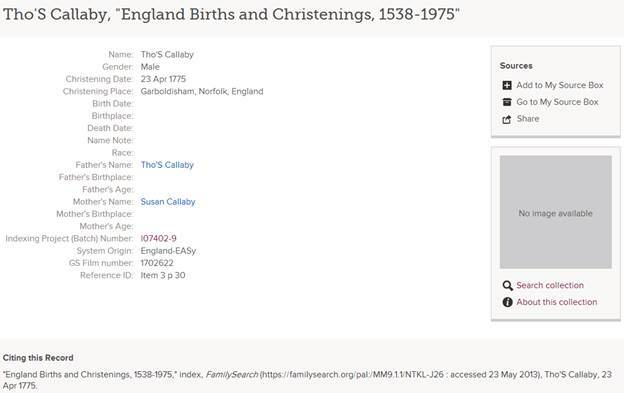 FamilySearch is, on the face of it, a good place to research your Norfolk ancestors because it has images of most of the Norfolk parish registers. However, whilst they are in the process of transcribing the entries if you search for Norfolk baptisms at the moment the entries are most likely to come from datasets inherited from the old FamilySearch site - and as Peter pointed out, these leave a lot to be desired. However, when checking Garboldisham baptisms in the digitised registers he couldn't find a corresponding entry. Indeed, it was only when he searched at FreeREG, the amazingly underfunded and unappreciated sibling of FreeBMD, that he discovered that the baptism actually took place at Docking - which is on the other side of the county! Of course, we should never rely on transcriptions - but the real problem here is that someone looking for baptisms in the Docking area might well disregard an entry ascribed to Garboldisham. Peter tells me that he has come across many similar examples - have other readers had a similar experience? Wills for England & Wales from 1858, when the responsibility for record-keeping passed from the Church to state, are held by the Probate Service and you can search the National Probate Calendar for 1858-1966 at Ancestry. But finding wills prior to 1858 is often much more difficult: most Welsh wills are available free online at the National Library of Wales site, but it can be much harder to track down English wills. Most readers of this newsletter will be aware that wills proved in the Prerogative Court of Canterbury are available at the National Archives website for £3.36 per will (or free to Gold and Diamond subscribers at The Genealogist) - but there were as many as 300 other courts that had jurisdiction over wills at some point or other prior to 1858. Pre-1858 Probate Jurisdictions is a valuable free resource at Origins.net - there is an outline map of each English county (based on the pre-1974 boundaries) showing which parts of the county were subject to the jurisdiction of each archdeaconry or diocese. Origins is also home to the National Wills Index, some parts of which can be searched free of charge. You can search several will indexes at findmypast, and wills for Cheshire can be viewed online. FamilySearch has images of many Kent wills, but they are only viewable at certain FamilySearch centres. Wills for the Diocese of London Consistory Court were indexed by volunteers at the London Metropolitan Archives and there are online indexes here, but there is a larger collection of London wills at Ancestry. Don't worry, I'm not setting up a dating site - LostCousins is all about finding relatives, not future partners! What I really want to tell you about is a new figure called Match Potential that you may have noticed on your My Summary page - it indicates how many new relatives (or 'lost cousins') you are likely to have found given average luck. For example, if the number shown is 1.49 then the chances are you've found 1 or 2 new relatives (and if you've found 0 or 1 you've been less fortunate than average, whilst if you've found 2 or more you've been luckier than most). How can you increase your Match Potential? The great thing is, you don't necessarily have to do anything! Naturally the quickest way to see an improvement is to add more relatives to your My Ancestors page, especially relatives from the 1881 Census - but your Match Potential also goes up when other members add relatives to their My Ancestors page. For example, if everyone reading this newsletter enters just ONE relative from the 1881 Census my own Match Potential will go up by 0.23 even if I don't enter anyone myself. Of course, if you haven't entered any relatives at all, your Match Potential is going to stay at zero no matter how many relatives other members enter. This reflects the fact that until you provide some information the LostCousins computer can't possibly know who your cousins are. Try looking at it from your cousins' point of view - even if they enter thousands of their own relatives (as some members have), they'll never be able to connect with you. On the bright side, when you start from a low base it's very easy to make a difference - even 10 minutes could take you from 0 to 0.1 or more, so just imagine what 10 minutes a day would do! When I was a young boy in the late 1950s I was absolutely fascinated by science fiction, and would walk around the public library looking for Gollancz titles in their distinctive yellow jackets. When man walked on the moon in 1969 it seemed as if science fiction would become science reality, but eventually the money ran out and took the dream with it. I wrote last month about the plans to send a couple to Mars with no apparent means of returning to Earth. This week's New Scientist has an article describing ambitious plans to set up a permanent colony which would grow its own food in Martian soil, and mine resources that can be shipped back to earth - rather like Avatar (by far the best 3D film I've ever seen). Plants would need to adapt to the environment, but so would humans - and it's possible to imagine that over many generations the colonists would develop distinctive characteristics, just as Americans of British origin usually speak very differently from the descendants of the relatives their ancestors left behind. Some scientists believe that the remains found on the Indonesian island of Flores (often referred to as the 'hobbit') could be those of an island population that developed differently because of its isolation. If the human race does manage to create a self-sustainable colony on Mars, I wonder whether at some point in the future they might evolve into a different species? Postscript: one of the proponents of the plan to colonise Mars is Buzz Aldrin, the second man to walk on the moon. Many years ago I had an opportunity to talk to him when he was promoting a computer game - but sadly I didn't follow up on it. I wouldn't make that mistake again! "Your newsletter has recently covered stories about cemeteries and the vandalism of the authorities responsible for their maintenance. They always take me back to my time as an 18 year old trainee surveyor in the Estates Department of Leicester City Council in the early 1960s. Apart from more conventional estate management responsibilities this department also managed the city cemeteries. One day the senior surveyor in charge of that responsibility told me that he was off to see the 'digger driver' to ensure that he was doing his job properly. I naively asked him what they used a mechanical shovel for at a cemetery and he patiently explained its many uses - but on that day they needed to scrape the area where ashes were strewn because after many years use the ground was much higher than the surrounding area, which didn't look right. Somewhat shocked I asked him what happened to the 'scrapings' and he told me that they were put on lorries and taken down to a municipal tip." 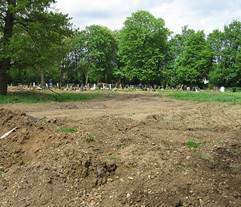 Lesley recently visited Manor Park Cemetery, where several of my own ancestors are buried, and took this photograph of an area that has been cleared and bulldozed ready for reuse. "We spoke about the razing of parts of the cemetery, something he was unhappy about. He told me that some gravestones had been moved from their graves, and propped up by a wall where they were left, turned towards the wall so they could not be seen. Others had been sold for re-use, new inscriptions being carved on the reverse side! Even large monuments in granite or marble were being sold for ridiculously low prices. "He spoke of his belief that a history was shown on the gravestones. He showed me one for some of the hundreds of victims of a Thames boat disaster when it had been hit by a large vessel on its return to London after a pleasure day trip." As the prices of burial plots rise there are new cemeteries springing up around the country, some of which are seeking finance from investors based on projections of a continued increase. My personal suspicion is that the trend towards cremation will continue, and so there's a possibility that some of the investors will get their fingers burnt (rather than reaping the anticipated profits). At least Manor Park has its records online, so that they can be searched at a reasonable cost - allowing interested relatives to take the necessary action to protect their ancestors' resting places. It cost me nothing to search for relatives who are buried there using Deceased Online, and whilst I subsequently spent £20 on credits to get the details of the burials, I could easily spend one hundred times as much searching in the paper records of the nearby City of London Cemetery, yet find nothing. Shouldn't all cemetery records should be made available online before cemeteries are allowed to reuse plots? "I was in the building at the time and we all thought it was just another false alarm until we got outside to see the roof on fire and smoke and flames billowing upwards. The fire was in the extension at the back of the building where new collections were being categorised. The roof collapsed and there was water damage to six floors. The staff lost all their personal possessions and there was damage to some of the collections. I had this information from a friend who works there. "I cannot tell you how distressing it was for us to stand in the car park watching this fire take hold knowing that maybe irreplaceable damage was being done to pictures and documents. When I have been asked what I would rescue if my home was ablaze I have always said my precious photos and family history collection because they are irreplaceable and to me more valuable than the crown jewels. Apparently workman had been doing repairs at the leisure centre which adjoins the building and I am highly suspicious that one of them may have been responsible just as they were for the fire at Windsor Castle which did so much damage. As we left Aberystwyth you could see the smoke for miles, it looked like a bomb had been dropped.It is a day I will never forget." The cause of the fire has now been identified - according to a statement by Mid and West Wales Fire and Rescue Service it was caused by a blow torch that was being used to strip bitumen from the roof. What possessions would you want to rescue if your home was going up in flames? Note: the Aberystwyth Crew Lists which I thought could be viewed online (see last issue) can in fact only be seen when you visit the National Library of Wales. Hopefully that will change in the near future. 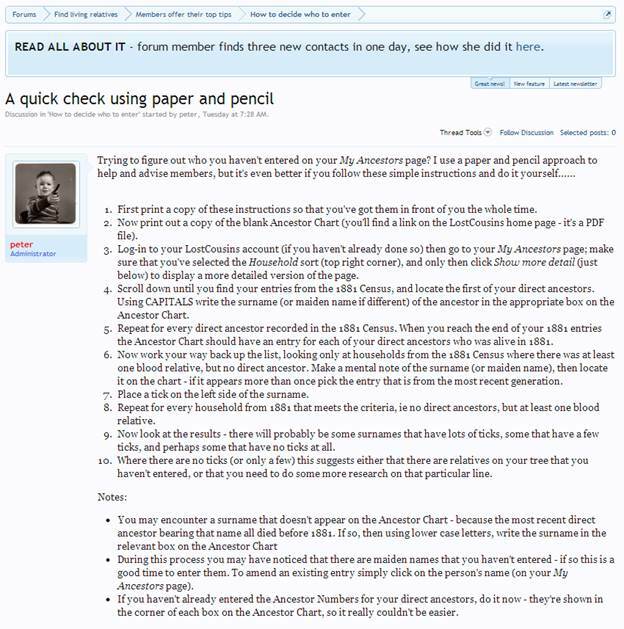 There's an article in the latest (June 2013) edition of Your Family Tree which suggests that you can improve your research by developing key skills. Several of them are skills I've tried to nurture in readers of this newsletter - such as "Eliminate the impossible" (see the article from last August entitled Is the answer staring you in the face), "Lateral thinking", and "Logical problems". If you play the game many times over the prize must start off behind door A one-third of the time, door B one-third, and door C one-third. Since the prize can't move from one door to another, at the end of the game the prize must also be behind door A one-third of the time, door B one-third, and door C one-third. This means that if you always pick door A and stick with it you can only win one-third of the time. One-third of the time B will be the winner (and the host will open door C); one third of the time C will be the winner (and the host will open door B). This is why switching doubles your chances of winning from one-third to two-thirds - you win whenever the prize started off behind either B or C.
When the forum opens you'll be able to read other explanations posted by members, all of which confirm that by switching you double your chance of winning. Puzzles like this demonstrate how easy it is to be misled by our instincts - just as our eyes can be fooled by optical illusions, our logical mind can sometimes be overruled by emotion. And since researching our family history can invoke all sorts of emotions, we have to be extremely careful that our beliefs and fears don’t lead us to incorrect solutions. Tip: if you want to see an optical illusion, focus on the keyboard diagram in the next article, then scroll the screen up and down using the mouse wheel. What did you make of the gobbledegook in the newspaper article from 1900 that I featured last time? I was swamped with emails from members, many of whom put etaoin shrdlu into Google and found Wikipedia articles (and others) that explained why this gibberish occasionally turns up in old newspapers. Chris, one of our most loyal members, was the first to come up with the right answer, and he won a 12 month extension to his existing LostCousins subscription. 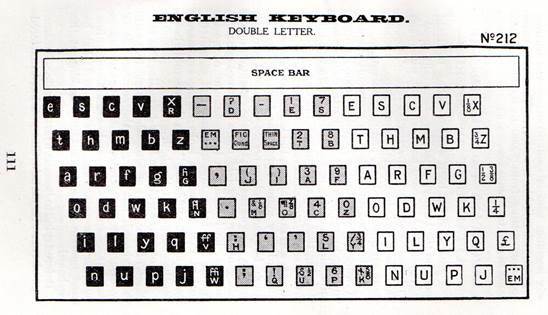 The diagram below, taken from a 1925 manual, shows the keyboard layout, which was quite different from that of a typewriter. The operator would run his finger down the first two columns of the keyboard until the line was complete, then start again on a new line. Normally it would be the job of a proofreader to remove the offending line, but it might also have been done by the typesetter himself. Reading the manual it was fascinating to see how lines were justified in those days. 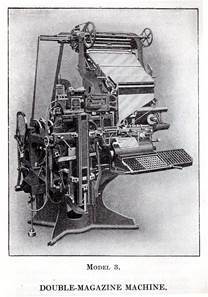 Spaces were created by inserting spring-loaded blocks between adjacent words and then - when there were was no room for more words on the line - the operator would allow the springs to expand, leaving evenly-spaced gaps between the words. It was only when I was corresponding with one of the scores of members who wrote in that I remembered an occasion over half a century ago, when my late father - who worked as a proofreader but had previously had his own very small (and barely profitable) printing business - took me to the office where he worked in London, and demonstrated a Linotype machine in action. I remember him putting his hand around the right-hand side of the machine and retrieving a slug of metal which bore a mirror image of the words he had just typed. What a shame I wasn't able to keep it as a memento! Twenty years later 'hot metal' became a thing of the past, as computerised typesetting took over, and proofreaders were pensioned off (my father retired at 65, just before his newspaper relocated in Wapping). Isn't it amazing how our memories work - and how previously forgotten events can suddenly come to the surface? It just shows how important it is to talk to our relatives and remind them of the things they've forgotten - usually it will be at least as rewarding for them as it is for us. You may recall that the same press cutting featured an article about the Rector of Runwell, in Essex, who had invented a contraption for ringing the church bells using electricity. Whilst I wasn't able to track down the patent he'd filed for this particular invention, Elizabeth in the US discovered several patents that he had filed there - you can see them by searching for Henry Kingsford Harris using Google patents. According to his 1941 obituary, which was carried by the journal of the Institute of Engineering and Technology, he was Rector at Runwell for 18 years, and you'll find him there on the 1901 census. In 1911 he wasn't in Runwell on Census Night: he was staying at the Constitutional Club in London, and as a fellow guest was a Patent Agent, I wonder whether they were meeting to discuss an invention? Note: the problem of finding bellringers is still with us - Nicola sent me a link to this article in an Indian newspaper. You've got one week left to save 10% on a findmypast subscription and collect a free LostCousins subscription. For full details see this article in my last newsletter (and please follow the instructions very carefully if you want to support LostCousins and qualify for a free subscription). By the way, if you think it's unfair that findmypast is offering discounts to new members I should point out that they're not discriminating against their existing subscribers - all subscribers to findmypast.co.uk get a 10% Loyalty Discount when their subscription is renewed automatically. "Further to your piece in the latest newsletter about Yahoo accounts being high-jacked. I received an email last Sunday supposedly from a friend, it came as something of a shock, she's been dead for 4 years! It was also addressed to one of her daughters, which I was disgusted by. If only these morons realised the distress they cause." Sadly people engaged in criminal activities don't care what problems they cause. All we can do is make it difficult for them by switching to mail services with better security, picking passwords that are impossible to break, and not using webmail unless we really need to. It's certainly a good way to get your Match Potential up - and it only takes 10 minutes to perform the check! Now a shopping tip - one that will probably work all over the world. As you know, I usually aim to visit my local supermarket around the time that they're reducing food for quick sale, and I often pick up ready meals that can be frozen at home. There's a wide range of them at my local supermarket, but I aim to buy the ones that come in clear plastic packs with lids - because I can reuse them to store in the freezer excess portions of meals I've cooked myself. Often the price I pay for the meal is less than the supermarket would normally charge for an empty plastic container, so it's a really good deal. Is summer just around the corner? I hope so! From Ibiza to the Norfolk Broads, the weather has been far colder - and in many places wetter - than normal, and the UK is on track for its coldest spring since 1979. Since I'm far more likely to be on the Norfolk Broads than in Ibiza I'm hedging my bets by downloading electronic books to my Kindle! Steve Robinson's genealogical mysteries are already there, of course, but there are an increasing number of non-fiction genealogy titles available for the Kindle. Finally, an offer that's only likely to be of interest if you live in the UK. Albelli are offering 67% off a large photo book with photo cover - which brings the price down from £29.90 to just £9.95 - and their No Quibble Guarantee still applies, so it's hard to see how you can lose out. Click here to go straight to the special offer page and use the promotion code NBUXLPB (offer ends 28th May). Just after this newsletter was published findmypast announced the addition of 450,000 parish records - for full details see here.